The PSD1001 is a quad channel DIN Rail Power Supply to drive measuring, process control equipment in Hazardous Area; it provides isolation between input and output. Typical application is to drive 4-20 mA 2 wires transmitter with local indication (current is not repeated in Safe Area). Output channels can be paralleled if more power is required. • Output to Zone 0 (Zone 20), Division 1, installation in Zone 2, Division 2. 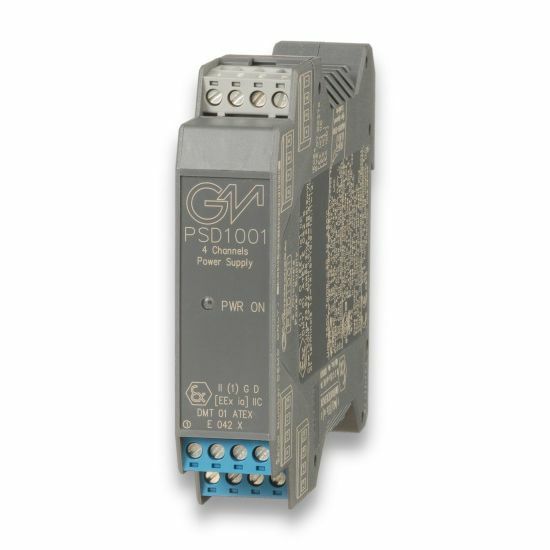 • 4 channels Power Supply for Hazardous Area equipment. • Flexible modular multiple output capability. • Output short circuit proof and current limited. • EMC Compatibility to EN61000-6-2, EN61000-6-4. • High Reliability, SMD components. • High Density, four channels per unit. • Simplified installation using standard DIN Rail and plug-in terminal blocks.